This top depicts a miso-grinding young priest (or perhaps an obake [monster/spirit]). 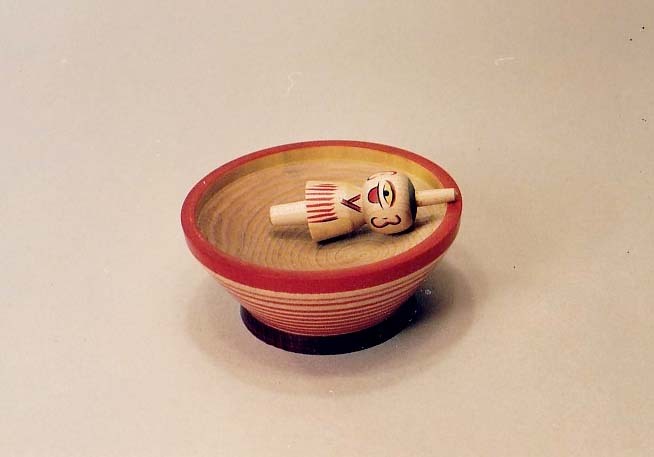 Hiroi-sensei believes the tale originated from Gunma or Tochigi prefecture, where there was a one-eyed and one-legged priest who ground miso for use in miso soup. The story of this young man eventually became the basis for the tale of a one-eyed, one-legged obake. Here, the top is the one-eyed man, and the base is the grinding mortar. When the top is spun, it mimics the motion of a grinding pestle in a mortar.